By now, your fresh, free-range turkey has been ordered, the RSVPs have been tallied, and it’s time to double check those shopping lists. Thanksgiving is all about traditions; when else does anyone put a marshmallow on top of sweet potatoes? As much as we love traditions, we are here to share something that might be new to you. An added bonus is that you can prepare this delicious dessert a day or two in advance. Other than the holiday meal, there’s nothing more satisfying than crossing something off your holiday to-do list. You’ll have a carefully home-baked dessert ready to go, regardless of what else happens in the kitchen, and what surprise guest appears on your doorstep. 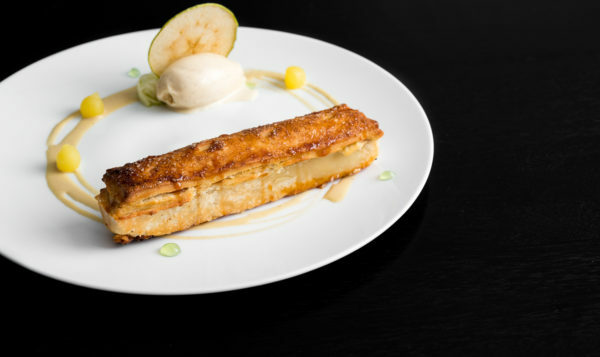 Among the many memorable dishes served at element 47, Pastry Chef Amy Andrews’ Apple Pie will certainly stir the strongest sense of nostalgia, comfort, indulgence, and delight. 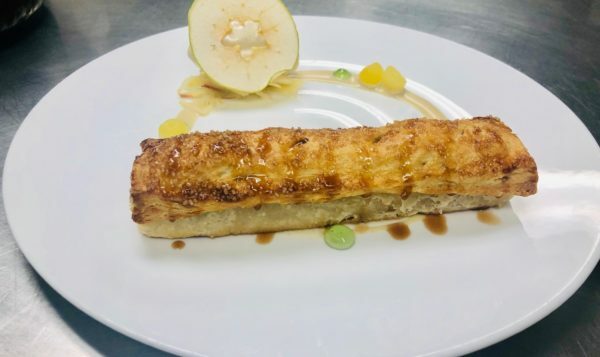 Our Apple Pie, introduced on the Winter 2018/19 menu is sure to be a total crowd-pleaser thanks to Amy’s talent, experience and dedication to the art of baking. We don’t doubt that you have a trusty apple pie recipe in your arsenal, but Amy’s pie, with its apple cider reduction, just might be your family’s new favorite. You can also make this your own by picking out your preferred apples from your local farmers’ market. The fresher the better! An accomplished pastry chef, Amy began her baking career as a college student. Since then, she has traveled the world in an effort to learn about as many different baking styles as possible. Absorbing various cultures and cooking techniques during her travels, Amy has since refined her Apple Pie recipe to the pure delight that it is today. As the holiday season quickly approaches, we encourage guests (both former and future) to try their hands at this dessert. -Toss into the flour mixture until the butter is all coated. Using cut in method shingle the butter. -Pour over the flour and butter mixture. Put onto the bench and mix by hand until combined. Let rest. Roll to 3mm thick. Cut a 8cm X 23cm rectangle for the bottom. Cut a 6cm X 23cm rectangle for the top. Spray and line the rectangle mold leaving a small amount of the dough hanging over the edge of the mold. -Using a mandolin cut the apple thin from bottom to top. Cut into thin rectangles. -Combine in a bowl and toss the apples with the mixture. Line the apples in the dough lined rectangular mold. Mound the apples. Egg wash the hanging pie dough and cover with the smaller rectangle of dough. Press gently to seal. Trim the edges with scissors. Egg wash the top dough and sprinkle with sugar in the raw. Bake at 400 degrees high fan for 8 minutes. Turn the oven to 375 high fan and bake for an additional 6 minutes. Once cooled release the pies. A knife may be required to release. -Peel apples into acidulated water. Using a melon baller, ball the apples into a sous vide bag. -Seal and sous vide at 182.5 degree farenheit for 10 minutes. Place in an ice bath. -Combine in a pot over heat and whisk until the mixture begins to boil and slightly curdle. Transfer to a blender and blend until smooth. Ice bath to cool. -Using a mandolin slice the apples from top to bottom. Dehydrate at 140 degrees for 4 hours or until dry and crisp. -Whisk until the mixture boils. Continue to boil for 3 minutes. Let cool in a hotel pan or the lid of a shoe box… Once solidified blend in a vita prep until smooth. -Reduce Apple Cider until thick. -Add to a pot, add ginger and bring to a boil, then chill. -Add Vanilla Ice Cream Base without Vanilla Beans. – The apple pie served at element 47 is a contemporary presentation made in a rectangular mold. This recipe follows the same steps with the same ingredients, but is designed to be made for three to four 8” pies. Keep in mind the filling will have to be increased significantly (X20) to fill the shells. – The ingredients are all quite easy to find nationwide. – This recipe is something I have been making in various forms for ideas like pop tarts, hand pies, turnovers etc. Don’t be afraid to experiment! – The pie is best-served warm and I like to add dulce de leche or caramel sauce, vanilla ice cream or caramel ice cream.